I have a new item in my shop and on my website. I don't know why it's taken me so long to get these going again. It was always my best seller. It's a set of interchangeable earrings. 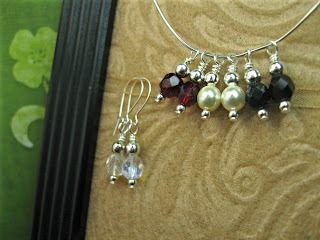 It comes with a pair os sterling silver ear wires that close for extra security, and 4 sets of drops in classic colors-Garnet, Crystal, Jet, and Pearl. Each set will come packaged in a little metal tin that will not only help keep the earrings all in one place and easy to find, but great for travel as well. 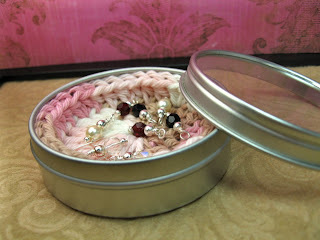 As an extra bonus, the tin will also contain one of my crochet cotton scrubbies (that you can use on your face, dishes, etc). For only $16, this is a great starter set, and you can always add extra dangles from my site or my shop for a greater variety. I love the packaging and the scrubbie. I bet people would leave it in there to protect the danglies. Fun! I think that is a great idea. I just marked your shop as a favorite. Oh, that's a fun idea. Very cute.